All in One & Moore Building Systems has been in business for more than 30 years, servicing central and southern Massachusetts with all your subcontracting needs. All in One & Moore Building Systems is a part of the Installed Building Products family of companies. 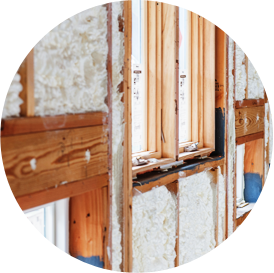 IBP is the second largest insulation installer in the U.S. residential new construction market. We sell and install a variety of products and services, all with one goal in mind: making your life easier. Our trained staff of professionals will get the job done right, on time, on budget and safely. With our experience and our dedicated staff to serve you, you can rest assured you’ve come to the right place for expert installation of fiberglass, foam and radiant barrier insulation, along with gutters, waterproofing, closets and shelving systems and fireplaces.